OCast perçebes, L. Pollicipes pollicipes, Eng. 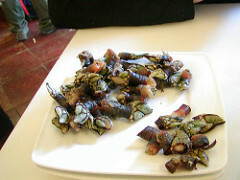 barnacles, percebes, mollusks, common on the coast of Galicia. They are a saltwater crustace, not a mollusk, living in colonies and clinging to rocks or anything solid, like boats and piers, in shallow water, especially in the Atlantic. There consist of over 800 species. They to not have shell, but calcareous plates, surrounding its stalk-like body. Theis ‘stems’ are like an electronic chip today in that a minute circular space contains all the necessary organs, mouth, feathery cirri (slender feet) to strain food from the water and beat it into their stomachs, the intestines, reproductive organs, and anis. There are males and females. Although responsible for extensive damage to piers, ships and other structures by living on them, the colonies tend to reside in the most dangerous part of the ocean, where no fish will swim because of brutal waves and dangerous currents and undercurrents that can slap fishermen to their deaths by slipping on slimy barnacle excretions or being smashed against barnacle covered rocks and their razor sharp calcareous plates. As human life has come to have a price, the cost of barnacles continually increases. The best barnacles are from Galicia. They are those on the sunny side of rocks. They are boiled in salt water during the length of time it takes to recite the Lord’s Prayer. By snapping off the stems, the white meat is pulled out and consumed. It should be noted that Roman Catholic countries pride themselves as having the best barnacle cooks. They maintain that clocks are useless when cooking barnacles and shellfish. Some require an Ave Maria and others the prayer to Our Lady.